I have used many conditioner and this one is the best, I was casually browsing and decided to buy it! There is a noticeable difference after one use and my hair still looks good one week on, I have received compliments on my hair since using it. I am going to keep on using it, it is the best!!!!!!! This is the best product for styling my dry blond hair. It makes my curles so flexible. I simply leave it on my hair and then blow dry. I love this conditioner, I use it after I’ve washed my hair and don’t rinse it, leaves the hair perfectly smooth and shiny and smells amazing, very impressed as I genuinely didn’t expect it to be this good. Will purchase a full size. 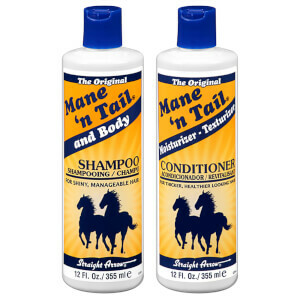 I love Mane 'n Tail Original Conditioner as Mane 'n Tail Original Shampoo but is the one who leaves my hair soft and Hydrated over all week,and I love the texture. I received a bottle of the Shampoo and Conditioner set in one of my beauty boxes. Used it for about 2 weeks and certainly didn't see the big deal. You have to use a lot of shampoo for your hair to get clean and the conditioner is basic. No better than any over the counter product you could buy. My hair is long and thick. A fair amount of dead ends because I haven't cut it in awhile. This S&C had no influence on the look either way. Fabulous conditioner which works so well after using the shampoo. My hair is 100% fabulous now. I noticed a big improvement after 3 washes. Excellent duo. Amazing conditioner (I have both the shampoo and conditioner). After only one use my hair is smooth and a little fuller! I just blow dried my hair, used no other styling products and am so pleased with the results - didn't even need to straighten my hair as it was so shiny and straight from the shampoo and conditioner alone!